Monica Maschak - mmaschak@shawmedia.com Kim Ribar, owner of Kim and Patty's Cafe, shares a laugh with food representative Mike Calhan in the McHenry restaurant Wednesday. Ribar, who has taken over sole ownership of the Cafe, has been waitressing for 31 years. Monica Maschak - mmaschak@shawmedia.com Jackie deLeon (left), Jennifer Rose and Kelly Harte from McHenry admire the veterans wall inside Kim and Patty's Cafe on Wednesday. "It's a nice way to comemorate them," deLeon said. 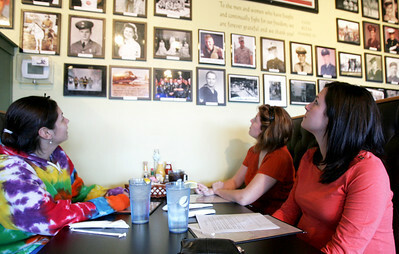 The photographs of the veterans now extend to two walls of the restaurant. Military family members can be seen grouped together on the wall. Kim Ribar, owner of Kim and Patty's Cafe, shares a laugh with food representative Mike Calhan in the McHenry restaurant Wednesday. Ribar, who has taken over sole ownership of the Cafe, has been waitressing for 31 years.